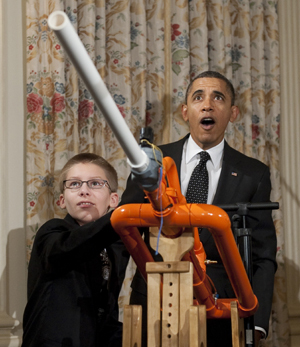 The maker movement is something worth looking into. It welcomes children as a fundamental force in innovation, teaching kids about math, science, engineering, and programming through invention. I came across two really great sites this week that can help your more tech-minded students get into invention, giving them a few great weekend projects or just a few really great science fair projects. The first is DIY.org, a website and app designed for kids that gives them a safe, supervised place to share their creations with the world and get feedback from the online community of builders. The second is a great video podcast called Sylvia’s Super-Awesome Maker Show. This little girl not only builds some really neat things, but in the true spirt of the maker movement shows others how to follow in her footsteps. Learn how to make your own backpack buddy, build a paper rocket, or craft your own silly putty!